Located minutes from the Keuka Lake State Park, "charmed" is the word that will come to mind when you enjoy a Finger Lakes getaway at Shamrock Hill. We wish you luck on finding time to squeeze in the many favorite hot spots Keuka Lake has to offer! After traveling up the winding driveway, enter through the back side of the house. Immediately to your right you'll find the first bedroom with twin beds. Continue down the hallway to the additional two bedrooms, both with lake views and cozy queen beds. The main living area of the house offers beautiful high ceilings and an open floor plan. The chef of your group will enjoy preparing meals in a kitchen stocked with a variety of cooking and eating ware. Stop at a local Finger Lakes market or roadside stand for local fruits and veggies to serve at every meal. While the chef is preparing meals, sit on the cozy oversized living room furniture, or at the dining area and plan out your adventures for your stay. 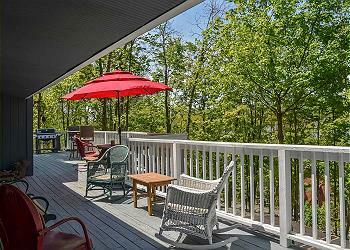 Outside, a balcony overlooks the rolling hills cascading along Keuka Lake. Listen to birds chirping and boaters cruising on the water below. Walk down a path to your private lake front and enjoy the day relaxing on the pristine water of Keuka Lake. The fun continues as the sun sets over Keuka Lake each evening. Roast marshmallows in the lakeside fire pit while you reminisce about your day with a new favorite Finger Lakes brew in hand.